Where is my tranquil Melbourne ? When I was reading theage.com.au yesterday, I was shocked to see the photo above. 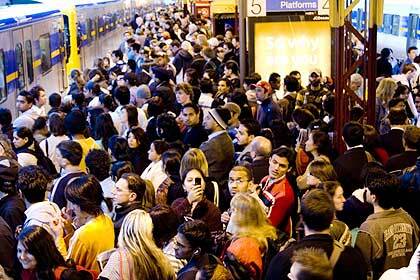 When did Melbourne, my favourate city have become so crowded? It is definitely not safe for public transport like this. This sort of image only reminds me of Hong Kong or Tokyo, not Melbourne. Almost three years ago, when Ed first arrived in Melbourne, he said :’Melbourne is too slow, it is like 20 years behind Toronto’. At that time, we were walking on the quiet, green and tranquil Drummond St in Carlton North, a neighbourhood I had lived for more than 5 years and still loving it. Obviously, Melbourne has changed since. During my recent visit back to Melbourne a few months ago, I recalled there were many incidences I was told to have to wait for at least 30 minutes for my favourite hot chocolate at Koko Black. Is Koko Black too popular? Or economic too booming? Or simply just too many people now? Apart from what I mentioned above, there are also Carabian Festival, South Asia Festival, Outdoor Art Festival，HOt and Spicy Festival, Art and Craft Festival, Taiwan Festival, The Beach Jazz Festival….you name it, you get it. Spending 3 months in Malaysia and Australia respectively this year, and now that I am in Canada, I have to admit, sometimes, I feel like a very ‘confused’ lady, regardless where I am. Well, the story begins when I realise I use different words to describe the same thing. Then, I get confused and people around me, either don’t quite understand me or get confused too. I am home again in Malaysia. Just arrived yesterday but already suffered from headache due to the hot weather. I could not sleep well and did not have enough time to sleep in Melbourne before I left. This was because I was too worried about my car sale and was too busy catching up with friends to say goodbye. Already five years, very reluctant sale …. 部落已搬家!! I have moved !! for more than 10 years. Friends, need your brain cells ! "The happiness does not make you a better person is not true happiness"
to my main photographer for this blog - Ed.